Do you see the frightening connection between the South Delhi Municipal Corporation’s decision to hike one-time parking levy on vehicles to construct parking facilities without any parking policy, and the promise of the Delhi Traffic Police to the Supreme Court to make Delhi traffic-jam free by 2020 with more flyovers, elevated roads, and foot over-bridges? Both reaffirm their blind faith that Delhi, even after committing one third of its land area to vehicle circulation and parking, can continue to do more of the same (more roads and parking) responsible for the problem in the first place. This precious real estate, if put to better use, could have earned more and housed more people in the city! But now, with some extra payment (reportedly Rs 6,000 to Rs 75,000 depending on their value) as a lifetime parking levy at the time of registration, and with no restraints on car usage, car owners will continue to enjoy lifetime right to use public spaces for parking for free or for pittance. This will now further harden public and political opposition to any subsequent effort to manage parking sensibly and use of parking pricing to reduce parking demand in the city. I have lost count of the number of times I have heard the following—“Why should we pay for parking when we have paid life time parking levy while buying the car?” Why are such ad hoc decisions being allowed now, when the city is waiting desperately for the new parking rules and guidelines to get notified and implemented soon? The Transport Department of Delhi has already finalised Draft rules and guidelines for parking management that, in congruence with MPD-2021, mandate detail parking management plans for all areas in Delhi, including parking pricing for demand management. We now need vision busters; too much vision-setting is happening these days, without any clarity as to whether it is really a vision or a nightmare in the making. Any parking pricing strategy needs a reason and globally, it is accepted that parking revenue generation cannot be an end in itself but needs saner reasons of managing parking, reducing parking demand and using revenue for the larger good. The South Delhi Corporation has not considered this and is only looking for immediate money to make more parking facilities in absence of a policy. There is already a bitter history in Delhi of how municipal corporations have collected thousands of crores of rupees from commercial establishments as one time conversion and parking charges, hoping to fix parking woes by constructing parking structures, but failed miserably. Most of the time, corporations have not even found spaces to build parking facilities in congested commercial and mixed-use areas. Without looking at innovative ways to reduce parking demand and improve other forms of access to these areas, the South Corporation now wants another means of revenue to fund more parking lots. It is refusing to learn. Municipal corporations and traffic police need to admit that more parking means more traffic and more traffic means more parking. This vicious cycle has to end. The municipal corporations will have to combine parking area management strategies with parking pricing across the city. And this is what the new draft rules and guidelines of Delhi are asking for—a consensus document of all these departments together. The draft rules are simply saying—let all neighbourhoods and wards have their respective parking area management plan to identify and demarcate legal parking area—on street and off-street— without encroaching into green areas, footpaths, bus stops or intersections and keep lanes free for emergency vehicles. Impose penalty for illegal parking and price parking variably to manage demand. Share available parking facilities—both off-street and on-street—for optimal use between different peak users in the area. With this in place, use parking revenue for local area improvement or the larger public good. Nothing else will work to tame the parking chaos. Have political courage to face this reality. If the purpose of the South Corporation was also to increase the cost of ownership of vehicles, as some media reports have hinted—then one-time parking levy is not the way. For that, they could have extended the polluter-pay-principle that the Supreme Court has already imposed in the case of big diesel cars and SUVs in Delhi and the National Capital Region (NCR). These vehicles have to pay a one-time environment pollution charge at the time of registration. Parking pricing is about moderating and influencing demand for parking usage and change in behaviour. Parking pricing cannot be imposed in isolation and unrelated to overall parking management strategy for an area. Before pushing for such isolated and ad hoc measures in the absence of city-wide rules and guidelines, the municipal corporation officials need to take a walk around the parking facilities they have constructed to see how these are working without an overall policy. It will be clear to them that while these structures have added additional parking capacity in the area, on-street parking around these structures has continued unabated, unregulated and even expanded. This augmented overall parking supply instead of reducing chaos has become a massive magnet to draw more parked vehicles, worsening congestion in the area. Some structures have remained under-utilised without area-wide management. So why create more structures without fixing the fundamental concerns? They will also find that even after providing for enough parking spaces in some commercial areas, parking chaos rules. The Delhi Development Authority’s assessment of Bhikaji Cama Place and the assessment of Jasola District centre by the Centre for Science and Environment (CSE) in south Delhi show that despite having surplus parking supply in these areas—more than the demand, on-street parking has worsened due to poor management of legal parking spaces. Corporations cannot run away from their responsibility for city-wide good parking management and finding ways of reducing parking demand simultaneously. When Delhi is facing the challenge of moving four crore travel trips a day, corporations along with Traffic Police cannot sit happy, thinking Delhi can become traffic-jam free in two years by only finding more money to build roads, flyovers and parking for cars and not tame parking demand and actively induce shifts to other travel modes and reduce car trips. Today, the magnitude of parking and traffic problem has assumed a proportion that is blocking even new/re-development in the city. The local, city and national governments have already seenhow each and every new/re- development projects (Kidwai Nagar, Nauroji Nagar, and proposed commercial centres in different neighbourhoods like Alaknanda) are drawing public ire and protests because of the fear of induced traffic and parking in an already choked and gridlocked city. But the city needs more legal retail and housing to be in step with urban growth (why else do we have such rampant illegal commercial spaces that are being demolished today). There is a huge deficit in retail and housing spaces in the city. But governments have not understood that it is possible to provide for more legitimate retail and housing spaces and meet the demand of urban growth without inducing more parking and traffic. Such solutions are possible and that is what other global cities are doing. The reality and the irony is that even our national and city governments’ own policies are asking for well-planned development with a mix of commercial and residential uses and affordable housing with easy walkable access to public transport nodes to reduce car usage. For such areas with augmented transit services, the Delhi Master Plan 2021 (a legally binding document) has already provided for reducing parking provisions. Just think of the re-development project at Kidwai Nagar (or for that matter, Nauroji Nagar), such fine areas within a few 100 metres of Metro stations where MPD 2021 rules require less parking than what is allowed normally. But is this adhered to? While even this requirement can be further minimised, these new developments can adopt public, common and shared parking to maximise asset sharing of utility between “uses with different peak hours of activity” in the same neighbourhood. This means, local residents can use office parking areas in the surrounding office and commercial complexes which become empty at night. Any increase in night-time residential parking demand can be met by renting these off-street commercial/institutional parking facilities within this area if a proper parking area management plan exists and design and fiscal incentives promote use of public transport. But an archaic policy mindset in implementing agencies resists new generation policies in India. Let us not beat about the bush any more hoping that it is possible to stay status quo. Face it. The kind of traffic and parking inducement that most neighbourhoods and prominent commercial areas have witnessed will sap even commercial attraction and value of property while seriously eroding livability of these areas. These areas will be penalised if congestion-related delays, difficult access, toxic exposure, inefficient last mile connectivity make them living hells with parking-related neigbourhood crime fanning fears. With the Metro, an improved bus system, well-regulated para-transit and walkability, it is possible to make the city accessible by minimising car usage. Pay attention to these priorities. 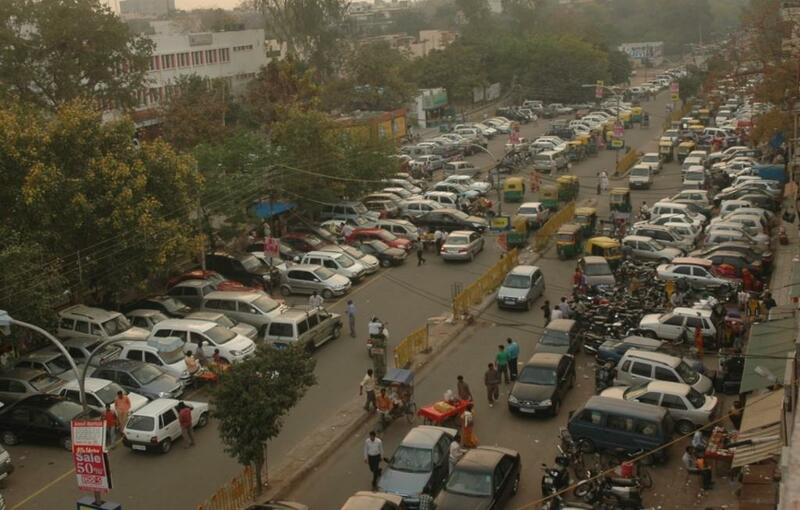 Delhi is a ticking time bomb, with the highest volume of travel and highest car stock among all metro cities. As time is running out, urgently kick in restraint even as the public transport systems are being modernised. Notify the new Parking Rules and Guidelines at the earliest for real solutions. I certainly do hope that today, as road and structural engineers are wishing each other Happy Engineers Day, they will help to discard fossilised approaches to city design and planning that are perpetuating the same problem, and enable new age solutions to align with the government’s own new generation policies.